I was paired up with Kerstin, the German girl with our group, and a girl from New York. The teenage daughter of the family we would be staying with met us at the boat and we followed her for about a half mile to her family’s home. 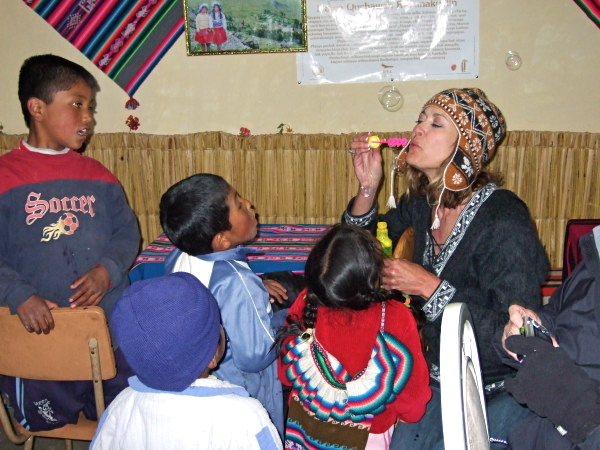 Luckily, Kerstin could speak Spanish, so although the native language of the people was Quechua (which resembles Spanish), the teenage daughter could also speak Spanish and could translate for her family. 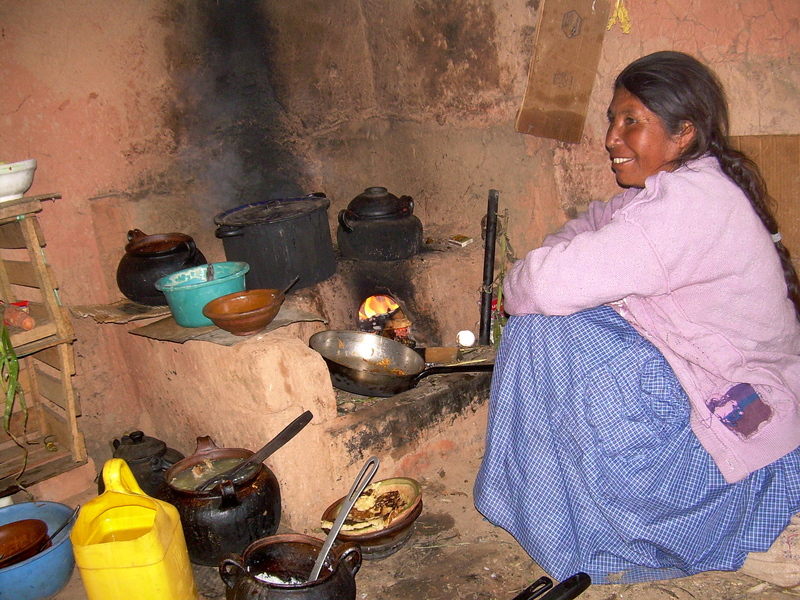 Here is the Mother cooking in the kitchen. (so don’t ever complain about having to cook again!) She was an excellent cook…dinner was scrumptious and the pancakes for breakfast were so good! This baby lamb was in their backyard, so the three of us corralled him (no easy task) and we got to cuddle with him! Here’s a photo of the Dad! We had brought a variety of gifts for the family…mostly food items and they seemed pleased with the bounty! It was great fun blowing bubbles with the kids at the neighborhood coffee shop! Look at the little boy in front of me…he’s pursing his lips like he’s blowing bubbles too! Somehow, we organized a game of soccer against five local, who didn’t speak English. I have never played soccer, but volunteered to be the goalie. Of the eleven of us on the tour, I was one of the oldest and don’t forget, we were playing at high elevation! But…we won!! I was determined to not allow even one of their forcefully kicked balls to cross that line! One of the balls hit my hand so hard, I was jumping up and down from the stinging pain and I still have a small knot (a souvenir) in the middle of my hand, to remind me of our victory! 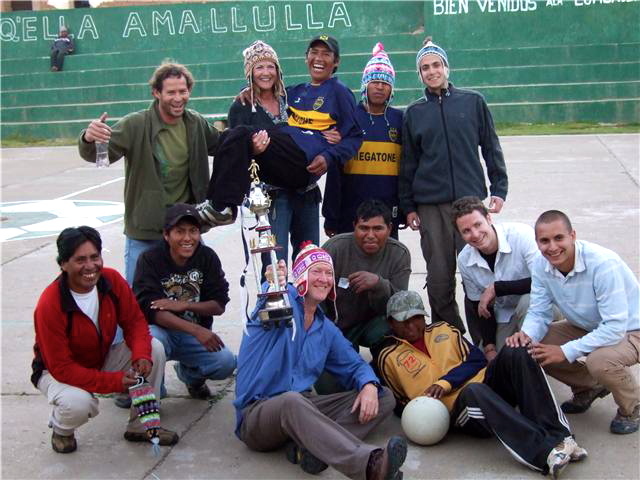 As you can see, I lifted up one of the Peruvian soccer players for our Victory photo…we couldn’t communicate through words…but he was obviously tickled with my show of “female strength”. I’ll bet this was the first time he’d ever been picked up by a “girl”! 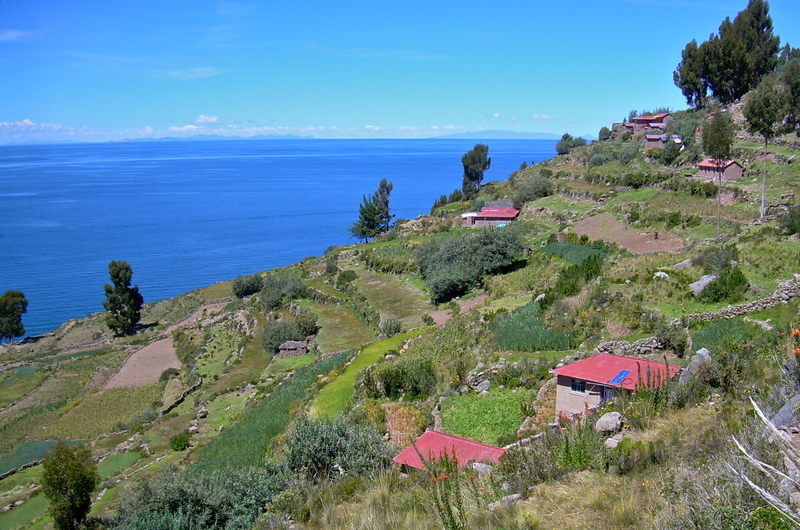 Stay tuned for…life on the water with the Uros people! Haha, you had me fooled, Sherry! 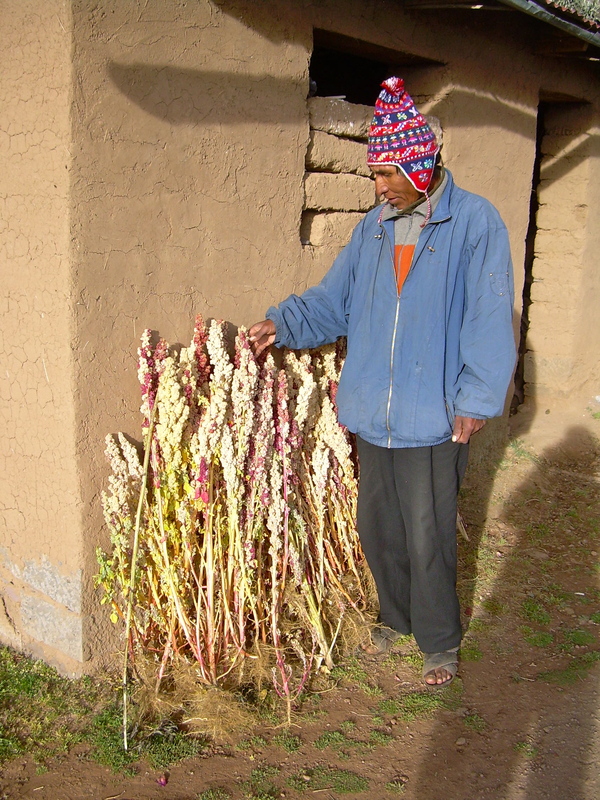 I thought I was going to get advice on how to pick up men in Peru. 🙂 Still, a great post! An exciting adventure. I love your photo of the arched entrance. Thank you…coming from you, that’s a great compliment! Thanks Martin…I’ll be over to check your blog out today! Such a GREAT post! 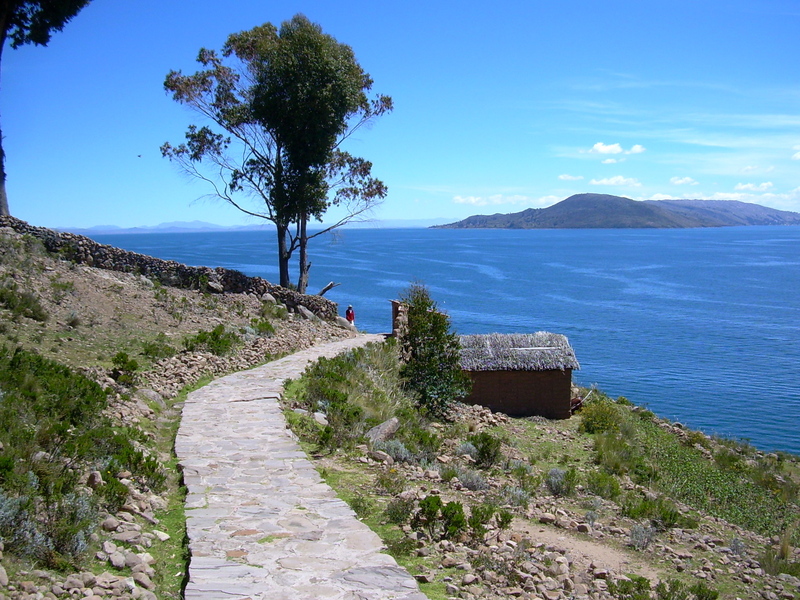 I’m going to Peru next month and your blog made me SO eager for the trip!! 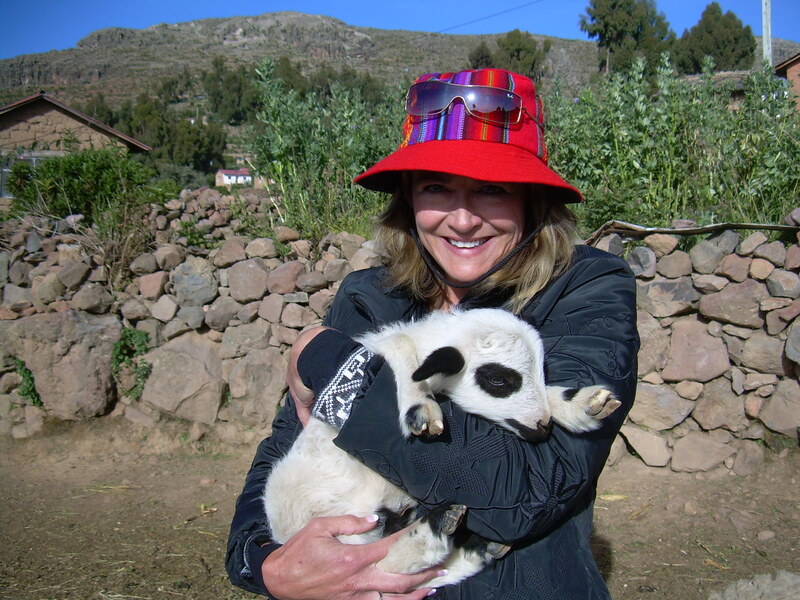 Lovely photos and what a great Travel Spirit you are, Sherry!!! The little boy blowing bubbles – THAT is adorable. I just got done looking at blogs where people have been everywhere, and seen everything, and that’s the photo that’s my favorite out of all of them. Us humans, crazy beasts. I love it. Thanks so much for leaving your sweet comment…we are crazy…and lovely! 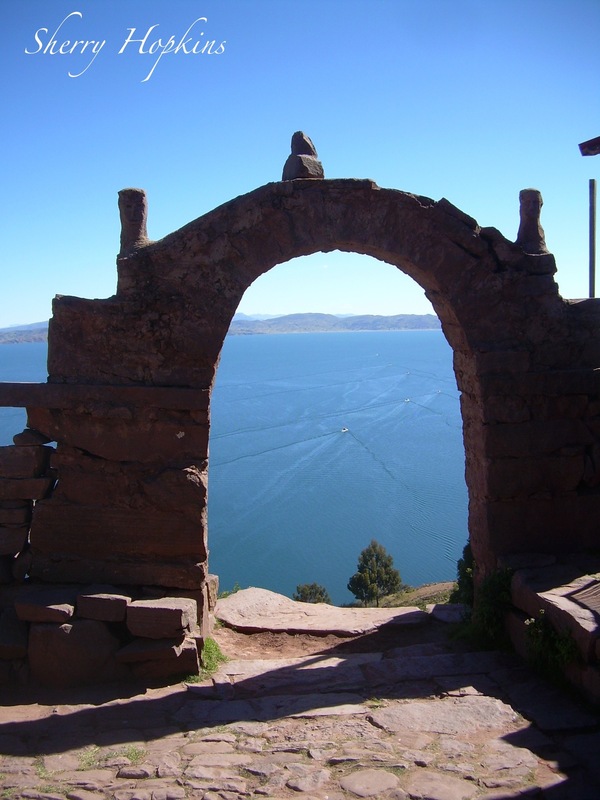 Oh my, the beauty of Lake Titicaca was beyond what I ever expected! I think that needs to be added to my bucket list now. Thank you for sharing and have a wonderful weekend :)! Interesting how the little boy pursed his lips as if he was going to blow bubbles too. I’ve seen kids respond to another person licking an ice cream – tongue out and licking the air. Funny. Love your pictures and your travel accounts. Great post. Wonderful mix of good images and story telling. Picking up men! Such a tease. Thanks Vic! Have a great weekend–TGIF! You crack me up…heheheh! You certainly brighten my day with your adventures. What a wonderful opportunity to be able to spend time with locals on this level. That is how you find the true beauty of a destination. I’ve always liked to impress people with my strength! But, you’re right…spending time with locals is the way to go! And I am not commenting that the photos are beautiful. I have done that enough times already for WordPress to think that I am a spammer. Thanks Sapna…I’m 5’10” tall–so that helps! Another memorable adventure. I love the photo of your picking up one of the soccer players. Thanks…that’s one of my favorite photos also. We were all having fun! Love reading about your adventures… thank you for sharing them! Thank you for reading Trey! I’m glad I can entertain! It was my first time to do that and I you’re so right. It was a wonderful experience!